Detailed Description: Pass & Seymour (LeGrand) 2-Pole 2-Position Manual controller in brown color is rated at 120/277 VAC/30 Amps and features oversized silver alloy contacts for long life and better heat dissipation. Includes side wired terminals that accept 14 - 10 AWG copper or copper-clad conductors for high conductivity. 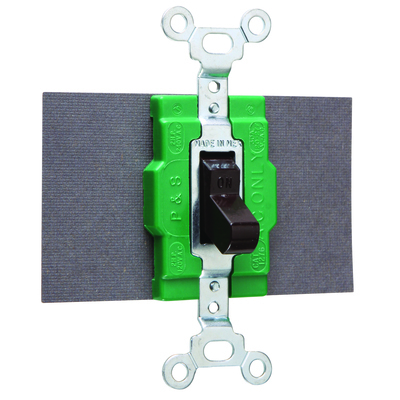 Controller has standard fiber terminal insulation barriers and can be mounted in standard device boxes or in NEMA 1 sheet steel enclosures. It measures 1.500 Inch x 1.469 Inch x 3.281 Inch. Features bodies/covers/toggles molded of durable nylon and is DPDT configured. Controller is UL/cUL listed and CSA certified. Catalog Description 30 amps, 120/277 volts, Double Pole, Double Throw Switch, Two Position, No Center Off, Brown.